OP 897: "Pekoms' Eescape from Cacao Island Plan." It's four minutes until the strawhats are supposed to meet up, and the Sunny is on the horizon. Smoothie orders they toughen security as they approach to keep the ship from escaping. Everyone anticipates Luffy to come out of the mirror, while inside Pekoms explains the "Sulong" form to Luffy, and how whenever he'd go into that form he'd lose his senses and become a mindless beast. But there was one person who could reach him, and that was Pedro. So basically Pedro was the only one who could bring him back to his senses. That's why he feels like he owes him. The plan is essentially for Pekoms to transform, run buck wild and let Luffy escape. Brulee calls this crazy since they've got enough forces to start a war waiting outside for them. Outside they can hear their voices from the mirror and prepare to shoot Luffy. Though it's Pekoms who comes out first surprising everyone. He's using Brulee as a shield so they can't attack right away. She begs for them to save her, but they're one sec too late as Pekoms takes off his glasses and looks at the moon. He begins to transform and everyone begs him to stop, and Oven is pissed that he'd drag his sister Brulee into all of this. 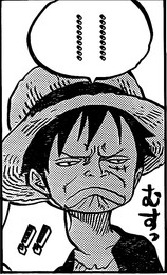 Luffy starts running, but he doesn't get far. He's about to get done in, but Sanji saves him. Sanji takes to the air with "moon walk". Unfortunately Pekoms is tackled down and they forcefully close his eyes and start to beat on him. Sanji doesn't get far either, but then the ships on the shore surrounding them explode. It's Germa 66, and Sanji asks why they'd save them. Niji says "We were just thinking we'd give them a hell of a surprise...!!" Sanji toujours la classe, par contre c'est moi ou le gars qui se fait crevé les yeux, en suppliant de l'épargner c'est un peu trash pour du OP? Je les avais presque oubliés !